New York state has issued a $100,000 reward for two murderers who escaped from a maximum-security prison in upstate New York. 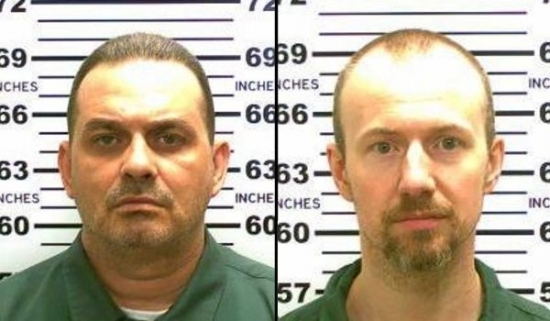 At 5:30 a.m. Sunday, 48-year-old Richard Matt and 34-year-old David Sweat were missing from bed check at Clinton Correctional Facility in Dannemora, NY. The men somehow obtained tools that they used to cut through the steel wall in the back of their cells. Afterward they had to crawl through a catwalk, break through a brick wall, cut into a steam pipe, crawl through the pipe, cut out of the pipe, and finally cut through a chain and lock on a manhole cover to emerge outside of the prison walls. They did this all without detection. The plan is reminiscent of 1994's "The Shawshank Redemption." This is the first escape for the prison that opened in 1845. Sweat was serving a life sentence for the 2002 killing of a sheriff's deputy. Matt was sentenced to 25 to life kidnapping, killing and dismembering his former boss in 1997. They should be considered armed and dangerous. A 17-year-old boy was struck and killed Sunday evening while riding his bike in Philadelphia's Hunting Park section. It happened around 7:15 p.m. near 7th and Cayuga Streets. Adelso 'Adeiry' Matos was with friends at a nearby park and had just left to ride his bike home. The driver ran a stop sign, hit the teen, and sent him into the air. A passerby attempted to perform CPR. Matos was taken to Einstein Medical Center where he was pronounced dead. The 28-year-old driver stopped at the scene. He was taken into police custody. He is expected to be charged with homicide by vehicle and DUI. Police in Salem County, NJ, are looking for a hit-and-run driver after a high school football player was critically injured early Sunday morning. It happened at 2 a.m. Sunday in the 100 block of North Hook Road at Lee Avenue in Pennsville. 17-year-old Kyle Pszenny was riding his skateboard home from his girlfriend's house when he was struck by a car that did not stop. Police were able to identify the vehicle as a Hyundai Elantra from the windshield wiper motor left at the scene. The car should have front end damage. Pszenny was taken to Christiana Hospital in critical condition with head and leg injuries. He already had one surgery to relieve pressure on his brain. Students at Pennsville Memorial High School are planning on showing support on Monday. The PMHS Facebook page is providing updates on his condition. Anyone with information about the accident or the driver should contact Pennsville Police at 856-678-7777.